Roff NSA Tile Adhesives is a blended polymer modified cement based powder tile adhesive. It gives excellent bond on cementitious surfaces like, concrete, plaster, etc. 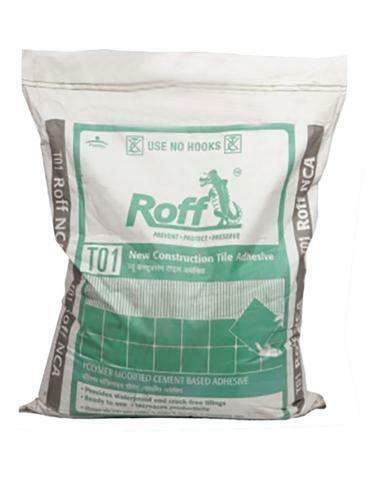 Roff Non-Skid Adhesive forms a waterproof barrier between two surfaces and has excellent ‘grab’ properties. This is an ideal product for Tile-on-Tile applications. Sagar Green Building Solutions Private Limited has marked its exceptional presence in industry as a reckoned wholesaler, supplier, distributor and Applicators from the year 2008 started in the name of Sagar associates. Since the company was found, all efforts are made to gratify customers immensely with the desirable product range. We are leading the industry for our capability of providing a huge assortment of Waterproofing Products, Waterproofing Chemicals like acrylic roof coating, cementitious coating, PU coating, PU injection, PU sealants, Expansion joint solutions. Tile Adhesives in all category like tile on tile, tile on wood, tile on metal, External wall cladding heavy duty adhesives, grouts, Epoxy Grouts, Cementitious Levelling Compounds , Epoxy Flooring , epoxy coating, Antistatic flooring Products, CPT Fitting Cleaners, Crack Repair Products, Epoxy Primers, Crack Fillers, Epoxy Based Adhesives, SBR Latex and many others. Our entire gamut is sourced from reputed and trustworthy manufacturers of the industry, who specialize in developing products with the help of cutting-edge techniques of processing as well as accurate chemical composition and other inputs. Over the years. Our company is satisfactorily and successfully accomplishing ever changing requirements of clients in a responsible manner. By satisfying clients immensely with qualitative and desired products, we have secured sustainable growth in the industry. As we are a client conscious firm, we take into account the valuable suggestion as well as feedback of our customers for satisfying their desires completely. Since establishment, we are following our philosophy of rendering maximum customer satisfaction.